All sandwiches are served with lattice cut potato chips and pickles. Substitute fries for $1.95. 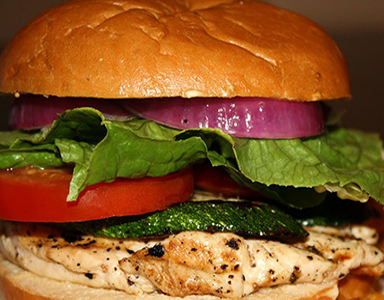 Grilled chicken breast topped with lettuce, tomato and onion. Served on a toasted brioche bun. Braised short ribs with our house-made BBQ sauce. An 8 oz tuna steak on a toasted brioche bun, topped with lettuce, tomato and onion. Remoulade sauce served on the side. House-made crab cake with remoulade. Lettuce, tomato and red onion served on the side. Fresh shrimp tossed in Old Bay mayonnaise on a toasted brioche bun with lettuce and tomato. A 6 oz strip steak on a toasted hoagie roll, topped with lettuce, tomato and onion. Horseradish mayonnaise served on the side. Blackened breast of chicken topped with cheddar cheese, lettuce, tomato and onion. Served on a brioche bun. Grilled cheese as it was meant to be! 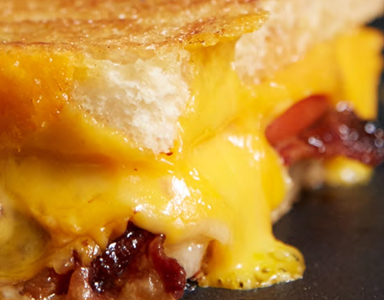 Bite into a hearty texas toast delight oozing with melted cheddar and provolone, topped with tomato and bacon.